Several decades ago, the time it took to prepare family meals was considered more of an investment in one’s health than a hobby. Today, the availability of processed meal products and fast foods with their savvy marketing, has devalued home cooking without regard for the consequences. So if you’re serious about your wellbeing, it’s time to get back into the kitchen! Why invest in your kitchen? Several studies show that by cooking more, you will eat more fruit and vegetables and expose yourself less to fast food. In one analysis of two studies of US health professionals, published in PLOS Medicine, those who enjoyed more meals prepared at home had a significantly lower risk of type 2 diabetes. Teaching younger family members basic cooking skills and food literacy could be one of the most important things to help them eat better for life. In Australia, the Stephanie Alexander Kitchen Garden National Program, trialled in state primary schools, showed that children taught to grow and prepare vegetables from scratch are more likely to eat them, as well as increasing the variety of veggies they’re willing to eat. But it isn’t just about a better quality of diet. Investing more time in your kitchen will also save you money. In the Seattle Obesity Study, eating home-cooked meals was associated with diets lower in calories, sugar and fat—and it didn’t increase monthly food costs. You don’t have to cook every night. Just dedicate three regular cooking times during the week and use your fridge and freezer more. Share the jobs, starting from procurement and preparation to clean up and garbage disposal duties—everyone will appreciate the food more. Take advantage of the weekend to get ahead. Roast a tray of veggies, cut up salads, bake tofu or boil some beans. With minimal additional effort, these can be turned into soups, sandwiches, risottos, pasta sauces and salad meals during the week. 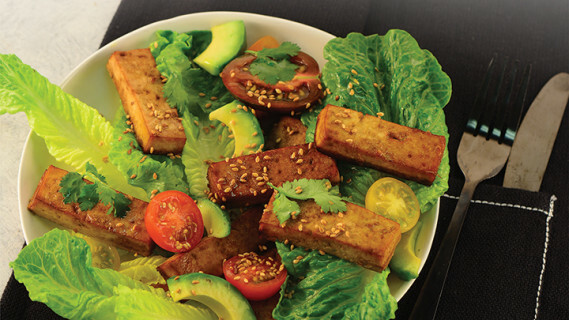 Baked tofu is delicious on salads and as a sandwich filling. A healthy plant source of protein, it’s a perfect chicken substitute. The natural isoflavones in tofu protect against heart disease, osteoporosis and breast cancer. Cut tofu block into 32 or 48 strips, about ½ cm thick and place on a chopping board. Press down firmly with kitchen paper to absorb excess moisture. Whisk the remaining ingredients in a small jug to prepare the marinade. Pour half the marinade into a medium container (15cm x 20cm). Arrange tofu strips in the container (possibly in two layers) and pour over remaining marinade. Marinate in fridge for 1–4 hours or overnight. Transfer tofu strips into a large baking dish, so they are lined up in a single layer, and pour the marinade over them. Place in the oven and bake 20–25 mins, turning over the strips at half time. Remove from oven and allow to sit for 5–10 mins so that the tofu absorbs the remaining marinade. Serve warm or store in the fridge for several days. Cut tofu into any shape of your choice. Slicing thinly is the key to infusing it with the marinade. Swap tamari with naturally brewed light soy sauce. PER SERVE: energy 636 kJ (152 cal); protein 9 g; fat 13 g; saturated fat 2 g; cholesterol 0 mg; carbohydrate 1 g; fibre 3 g; calcium 52 mg; iron 2.0 mg; sodium 238 mg.